INDIAN has just announced the latest addition to its lineup – the new Scout Sixty, at Eicma in Milan. It's powered by a 60 cubic inch (hence the name) 999cc, liquid-cooled four-vale V-Twin engine, paired to a five-speed gearbox. It makes a claimed 78hp and 66lbft torque and has a claimed dry weight of 246kg. The suspension is shared with the more expensive Scout as well. The front gets non-adjustable forks with 120mm travel while at the rear is a pair of adjustable shocks with 76mm travel. Braking at the front is handled by a single two-piston caliper and 298mm disc. The rear gets a one-piston caliper and the same size disc as the front. It's a cruiser, so of course it's powered by a V-twin, but the new Scout Sixty ticks other cruiser boxes too. It's got a low 64.2cm seat height, which Indian says gives the bike a low centre of gravity to aid cornering, confidence and control. In terms of styling, it's got those swoopy front and rear mudguards, (or maybe 'fenders' is more appropriate) and styling that carries the lineage of the old Scout. 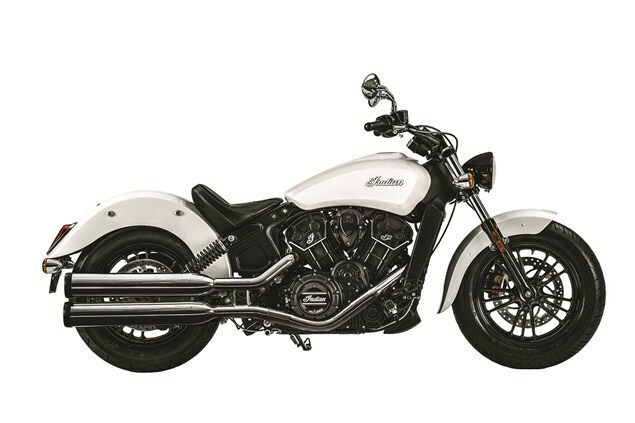 Indian says that the Scout is ripe for customising and will be offering a range of accessories including laced wheels, a different saddle, extended reach bars and foot controls, mini-ape bars and a Remus exhaust. We're told it's en route to dealers now and will be available soon for £8,999. That makes it the least expensive bike in Indian’s range and with the standard Scout being an entry-level route to Indian ownership, the Sixty provides a way for Indian to further broaden the brand's appeal. The Indian Scout has quickly established itself as a stylish, head-turning urban cruiser that is easy to modify and make your own,” said Indian Motorcycle Marketing Director Scott Meek. “With a UK price of £8,999 and even broader appeal to a generation who take great pride in standing apart from the crowd, we expect the versatile new Scout Sixty to cement that reputation.